...Enjoying Life...: Altenew 5th Anniversary Blog Hop Day 1 + Giveaway! Altenew 5th Anniversary Blog Hop Day 1 + Giveaway! 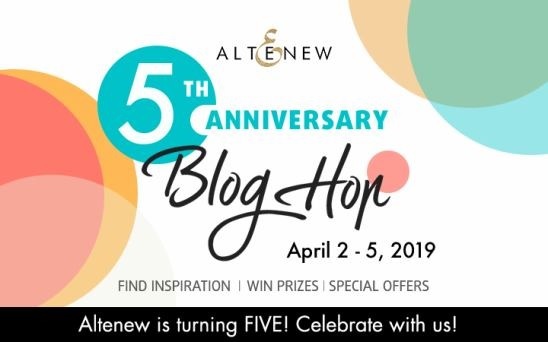 I'm so honored to be a part of Altenew's 5th Anniversary celebration and blog hop! Altenew's fabulous products have been a favorite of mine for a long time and I'm so excited to share my card with you today! You should've arrived here from the very talented, Joni Andaya'a blog. If you'd like to start at the beginning of the hop, head over to Altenew's blog. Altenew is giving away a $50 gift certificate to 5 lucky winners and one Altenew Academy class to 10 lucky winners. There are also 14 awesome companies/crafty friends who are celebrating with us! Be sure to leave comments by 4/12/2019 for a chance to win! 33 winners will be chosen at random from the comments left on any of the blogs along the hop and will be announced on the Altenew Blog on 4/20/2019. When I was deciding what Altenew product to use on my card, I couldn't resist grabbing their, Beautiful Day stamp set! I absolutely love this set and it's probably my most used floral set. That's saying a lot because I ADORE coloring floral stamps! I used Zig Markers to color the flowers and added a sentiment from Altenew's, Happy Bloom set. A few sequins finish off the card. I want to wish Altenew a very Happy Birthday/Anniversary! I hope you have many more years of inspiration and creating beautiful products for all of us to enjoy! Next up on the hop is my talented friend, Isha Gupta. Don't forget tomorrow is day 2 of the hop, so you'll be able to enjoy a ton more celebrating and inspiration! Yay! Beautiful Day set has just been added to my wish list. Thank you for sharing. So beautiful... and my favorite Altenew set! I love these beautiful spring colors! Thanks for being a great part of Altenew! One of my favorite stamps sets, too. Beautifully colored. Lovely card, the colors are so beautiful! I love this new stamp set. I’m so in love with Altenew!! Can’t earn money fast enough to buy all the ones I want but I do have quite a few … about 70 sets to be exact! So happy to be able to purchase them here in Germany!! Congratulations Altenew! 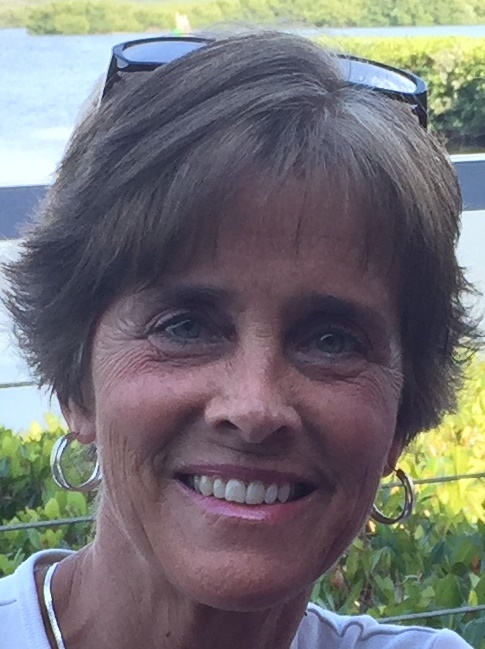 And thank you Barb for all your ideas and know-how!! Beautiful card. I love the colors. Thanks for sharing. Now Beautiful Day needs to be added to my "want" list - thank you for your inspiration! That's gorgeous! You really make those Zig markers sing. I love those flowers. I just love the gorgeous coloring in this card!! Took my breath away! Awesome idea. The way you colored the flowers is amazing. I love the blue paired with the orange center. It is so relaxing and beautiful to look at. Thank you! Beautiful card! Happy Anniversary, Altenew! Love the colors and Altenew. Happy Anniversary Altenew! Beatiful card, Barb. Happy anniversary to Altenew! Lovely card design Barb, the colors are very pretty and bring a ceirtain air of serenity to the design, love it!! Thanks for the inspiration! Beautiful Day is never a mistake. So Pretty! Beautiful card! I love the colors! Happy Anniversary Altenew! Thank you for making such amazing products! Such a beautiful job ! Love the colors in your card - so pretty. Happy Anniversary Altenew! Love this beautiful card, Barb!! This is one of my favorite stamp sets from Altenew!! Great color and card. Happy 5th Anniversary Altenew. Beautiful card using one of my favorite stamp sets. Love your coloring. Beautiful work. So delicate. Altenew makes it so easy to create beauty. It's a very lovely card! Happy 5th Birthday, Altenew! Beautiful card and I love the blue flowers as well as this awesome stamp set. Great job! The colors are gorgeous. Thanks for sharing. Such a bright, cheerful card! Wonderful coloring Barb, your blooms are stunning. Beautiful flowers and aqua color. Coloring flowers bring me so much joy too. Beautiful card! I see you use zig markers-they are on my want list. I love Altenew. My 'wish list" is huge and forever growing. Happy five to Altenew on a job so well done! what beautiful colors and simply beautiful..
Super card! Beautiful coloring!! HB Altenew! Such a beautiful card, Barb! What an amazing card. Happy Anniversary to Altenew. Barb your coloring is beautiful and your card sooooo fun. Thank you for sharing another way to use this favorite stamp set. Lovely job. Altenew has the most beautiful blooms. Especially love that they bundle the die too! Happy 5th anniversary Altenew. I love this set too. Your card is simply gorgeous. Your color choice for this flower card is beautiful. You put a lot of great shading and depth into your colored flowers. Lovely! Lovely card. Love the colors and the soft background around the flowers. This is such an iconic Altenew stamp set and you have colored them beautifully Barb! Yup this is a beautiful job. Love the colors and the iconic flowers. What great coloring! This card is beautiful! This light teal color is absolutely gorgeous!! These flowers just make me smile!! Lovely card!! Great way to showoff this Altenew set! Thanks for sharing. Beautiful card, thank you for sharing. Happy Anniversary to Altenew. Gorgeous card - love the colors! Wow. What gorgeous flowers!! I adore the color and the translucence of the flowers!!! Wow! loving the aqua colors on the blooms! Very pretty card!! Love that blue color you selected for these beautiful flowers! Love it, Bard! Love the color you chose, absolutely beautiful! Beautiful card. I love those blues and the layout is gorgeous. Beautiful card, especially love that color! Very pretty card. Love the color! Don't you just love this stamp? Happy 5th. Beautiful card.. love the colors!! Happy Birthday Altenew! One of my favorite colors, so lovely. Beautiful coloring and card design. Thanks for sharing your creation and thanks to Altenew for 5 years of great products! Such a pretty card and perfect colors!! Love your card. I have been looking at that stamp set. The colors are beautiful. You did a fabulous job. Beautiful Day is probably my favorite Altenew stamp also. Every time you make a beautiful card with it, I pull out the stamp set and use it again. Your coloring is always exceptional. Thanks for sharing with us. Wow - such a pretty card and I love the blue flowers!! Gorgeous coloring! I’m working on improving my shading and overall coloring. Altenew flowers are always fun to color! Very nice coloring on beautiful flowers. I like the blues you used. Thanks for celebrating with Altenew. This is so pretty!! I love the flower colors. The perfect birthday card to celebrate Altenew's fifth year of success. You created a beautiful card using the Beautiful Day stamp set. Inspiring! Beautifully colored flowers, one of my faves from Altenew. Beautiful BLUES! I love your coloring! Happy Birthday Altenew! 5 years! WOW! Amazing. THANK YOU for all your inspirations!! I love this card, and the aqua colours are vibrant and beautiful. Love! These blooms are so delightful, a great card Barb! Well your card certainly had the right stamp set “ Beautiful Day” because it surely was. I love that set. Great job on the coloring....it was really soft and pretty. Thank you so much for sharing your pretty card today. Barb, your blue beautiful flowers are spectacular! A great way to celebrate Altenew turning five!!!! Happy 5th Birthday to Altenew, your card is so pretty just love the colour too! Fresh florals in an elegant layout. Thank you for sharing your work. Love the colors of blue. So beautiful! Beautiful work! I love that color blue. I recently bought those zig markers and have yet to really play with them. Beautiful job with the Zigs! Beautiful Day is also one of my favourite stamp sets. You did a lovely job on the colouring. Thank you for sharing your talents. Tricia Podmore here,Stupendous card and color choice. Soooo creative! Happy Birthday Altenew and thank you for this hop and designer. So awesome! Nice choice of colors. Falling in love with this stamp set! Beautiful colouring of the flowers. Thanks for more amazing inspiration! This is so gorgeous!! TFS the inspiration!! GORGEOUS flowers!! Such pretty coloring! Very pretty card! I love the color of the flowers! Beautiful card! I love the colors! Thanks for the inspiration! Hi Barb, I saw this card on IG and thought it was AMAZING!! So glad to see you on this Altenew hop. What a gorgeous card - I love your colouring!! totally awesome Barb. A great card. This is one of my favourite stamps from Altenew. Beautiful color on the flowers and I love the shading you made - awesome! Beautiful card! The Beautiful Day stamp set is also my favorite. I love the color of your flowers. This is definately a great set and I really need to add it to my collection. Your card is lovely! Lovely card and love the colors too. Love to learn the art of coloring frm you. Such a pretty card, Barb!!! Thank you for sharing! Two of my favourites all in one card. Beautiful Day stamp set and zig real brush pens. What an amazing result! Beautiful flower + favorite color = perfection! Love this, Barb! A beautiful card . I really like the colors you chose. Enjoying being so inspired by all the beautiful creations on this blog hop. Your card is so pretty. Altenew's floral stamps are so gorgeous. Love the color of the flower. Wonderful details. Lovely job! Thanks for sharing your creativity! Happy Birthday Altenew! Love supporting an American company! Beautiful card!!! I like how you colored the flowers ! the colors are absolutely beautiful ! So clean and peaceful ! Love the card, I never think of making my flowers blue. "Beautiful Day" stamp set is one of my favorite ones and it's so nice to see another lovely idea for using it. Thanks for the lovely card and inspiration. You are right Barb, that stamp set certainly is aptly named. It is beautiful as is the card you created with it. Gotta say I love that you used non-traditional colours on your flowers. I've wanted to do that but hestitate. From now on I'm going for it. Thanks! Happy 5th Birthday Altenew! Very pretty card! Love your color choice for the flowers also! Lovely! Happy Anniversary to Altenew! Great job with the Zig Markers. I love them for coloring, too. Beautiful inspiration. OMG, your card is so beautiful. The blue flowers are stunning! Love this stamp set. One of my favorites. Happy 5th Altenew! Lovely card! Altenew's flowers are amazing!!! Thanks for the inspiration and congrats to Altenew! It is definitely a beautiful day when seeing the blue color of this card. Very pretty. Lovely card. Happy Anniversary Altenew! Well done Altenew! And congratulations! I really love your wonderful projects - especially your pretty flowers. Thanks for the beautiful card inspiration! This is one of my favourite stamp sets from Altenew. Beautiful card! Love the colors and of course, the flowers! Beautiful flowers! Love the color and how bright and cheerful your card is! Gorgeous card with a awesome stamp set. I love that you used one of my favorite colour mediums and stamp set. 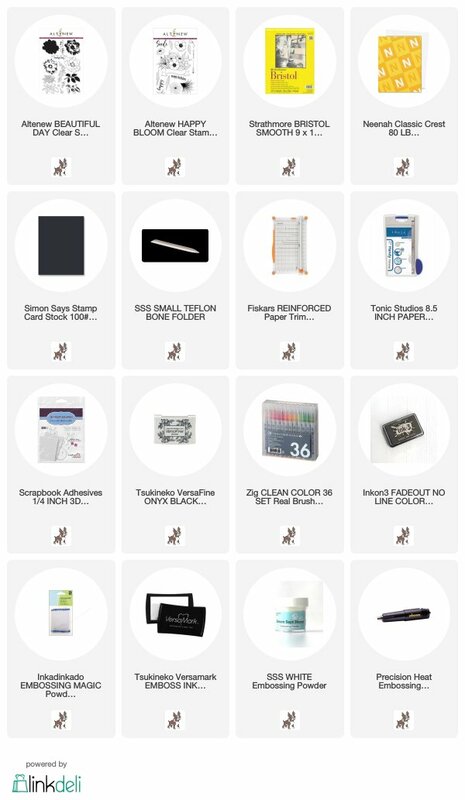 My favorite part of these bloghops is seeing the favorite products of designers. Sometimes they make me look at a stamp set in a new way, sometimes they remind me to use a stamp set that I love, but it's always fun and always makes for a special card. Thanks for sharing this with us and being a wonderful part of this community.